Birthday Wishes for Ex-Boyfriend: Writing something on a greeting card for an ex is a tough nut to crack. No doubt, it will remind both of you of the beautiful moments of the relationship you once had, and the painful memories of the breakup that followed. To start off, be well aware that it is not the best of ideas to send a text to your ex on his birthday. But if your heart tells you otherwise, take ideas from this post to write something that helps you express yourself. Whether you want to write something sweet because you miss him, something romantic because you still love him, something sarcastic because you hate him or something funny because you both have moved on – make sure your greetings convey exactly how you feel for him right now. Confusion is the last thing you want because sending the wrong signals to an ex can turn into a stressful nightmare. 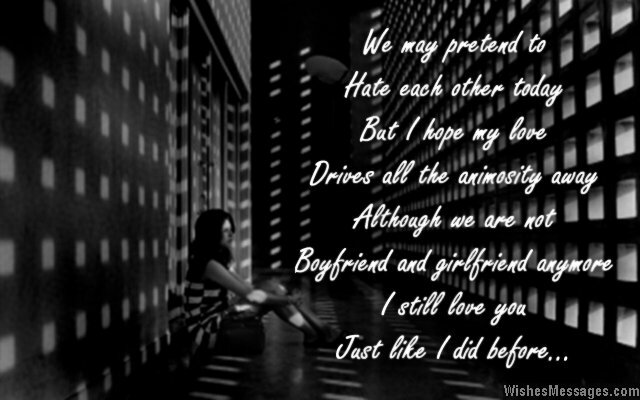 1) As we drifted apart, my worst fears came true. But deep down inside my heart, I still with the best for you. Happy birthday. 6) Ex-boyfriends are supposed to be arrogant and nasty, annoying and rude. Thanks for being none of that. Happy birthday. 7) There was a day when I thought that you were the best thing that happened to me. There was also a day when I thought that you were the worst thing that happened to me. Today I think that you weren’t meant to be the best or the worst – WE, were never meant to be and YOU, will always be my friend. Happy Birthday. 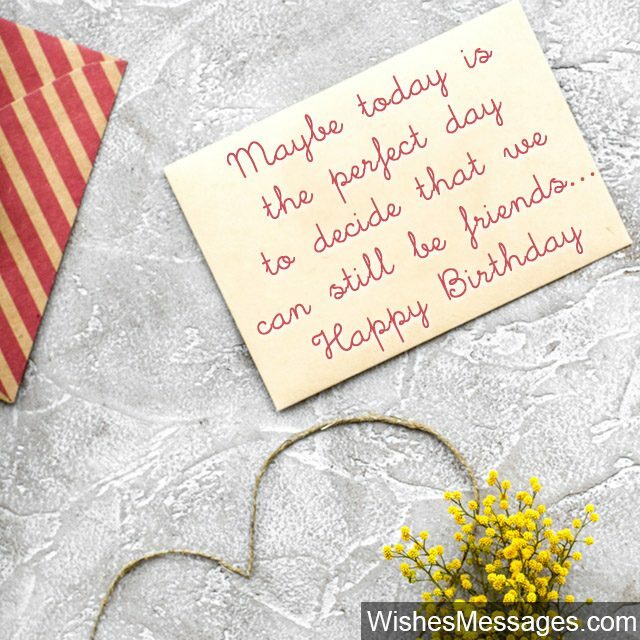 8) I may never forgive you completely but the fact that I am wishing you on your birthday shows that I will never forget you completely either. Happy birthday. 9) We will never know why we had heartbreak written in our fates, but I will always remember the beautiful memories of our amazing dates. Happy birthday to my ex. 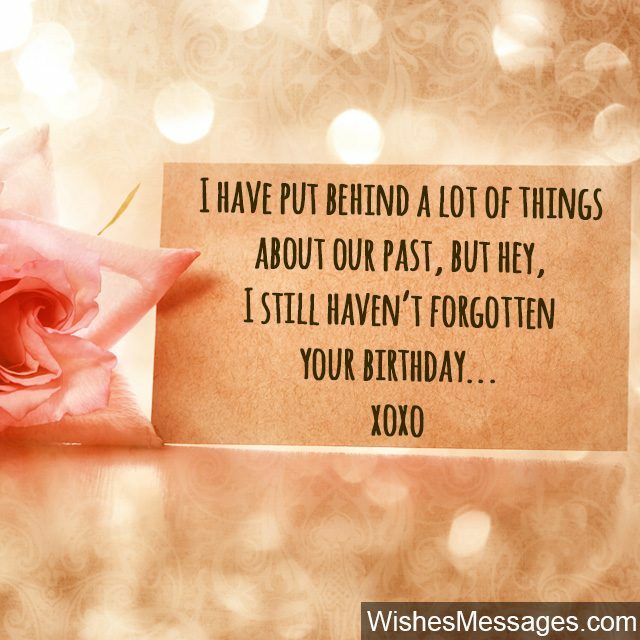 10) I think your birthday is the best day for me to tell you that I Miss You and I still want you back in my life. 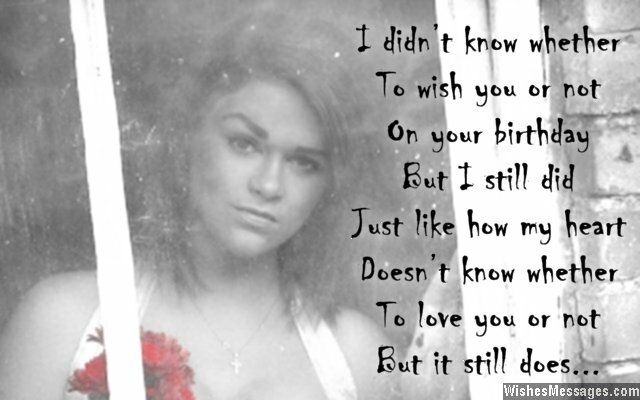 I hope you think about me when you blow the candles on your cake and make a wish that ends my heart’s strife. Happy birthday. 11) Sometimes I think I have moved on, sometimes I think that I still love you. 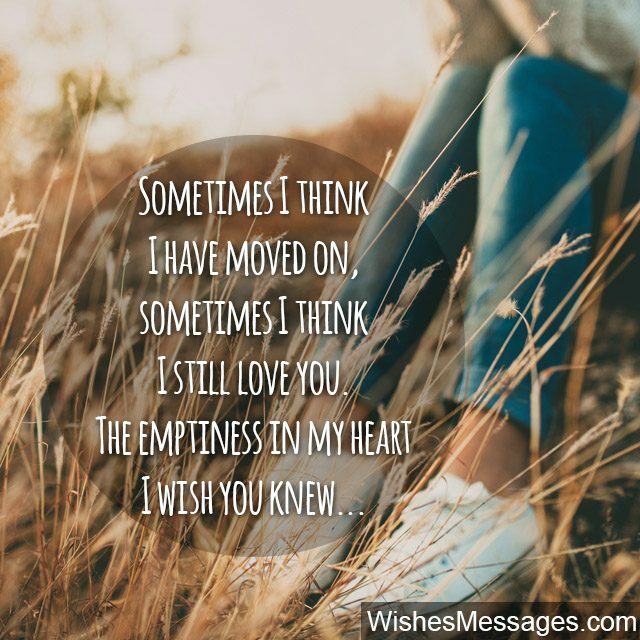 The emptiness in my heart and the confused state of my mind, I wish you knew. Happy birthday. 12) After all the love that I gave you, heartbreak is the gift that you gave me. But on your birthday, forgiveness is the gift I am going to give you. Happy birthday to my ex-boyfriend. 13) I have always been honest with you because there is no point in being fake. I still love you and I don’t know what it will take to heal the wounds of my heartbreak. I don’t expect you to feel the same but the least you can do is think about me when you cut your birthday cake. Happy birthday. 14) I may hold grudges against you for breaking up with me but I still cherish the beautiful memories I share with you. Happy birthday. 15) We never became good lovers but at least we became good friends. I am glad that we could move on from our past by making amends. Happy birthday. 16) Maybe today is the perfect day to decide that we can still be friends again. Happy birthday. 17) I always wished the best for you, I still wish the best for you and I will continue to wish the best for you in the future too. Happy birthday. 18) I will never be happy about what happened between us, but I am happy that at least we both have moved on. Wishing you a happy birthday. 19) Our relationship may be dead but our friendship still lives on. Happy birthday. 20) When we were going out I thought that you were a boyfriend not worth having. But after our breakup I think that you are an ex-boyfriend worth remembering. Happy birthday. 21) I have put behind a lot of things about our past, but hey, I still haven’t forgotten your birthday. Happy birthday. 22) You are not the only ex I have, but you are definitely the only ex that I don’t regret having. Happy birthday. 23) I may not have the right to kiss you or hug you. But I hope that I still have the right to wish you on your birthday. Happy birthday. 24) Our relationship has had many names. There was a time when we called it friendship. Then there was a time when we called it attraction, after which we called it love. Now I don’t want to give it any name at all. Happy birthday. 25) Today on your birthday I am going to give you a gift that I have never given to anyone before. It is the gift of forgiveness. Happy birthday. 26) I didn’t know whether to wish you or not on your birthday but I still did, just like how my heart doesn’t know whether to love you or not but it still does. Happy birthday. 27) Think about our love when you blow the candles, remember it was as beautiful as a rose’s petals. Think about us when you open your birthday presents, spare some time to think of all our beautiful moments. Think about me, if only for one day, because I miss you every day and not just on your birthday. Happy birthday. 28) We may not call ourselves lovers any more, but I think we can still call ourselves friends. I wish you have an awesome birthday. 29) This birthday wish is to remind you that we have moved on from our past and chosen to be good friends rather than vengeful lovers. Happy birthday. 30) When we started going out, I lost a friend in you but gained a boyfriend. When we broke up, I lost a boyfriend in you but gained a friend again. I guess we are now back to square one. Happy birthday. 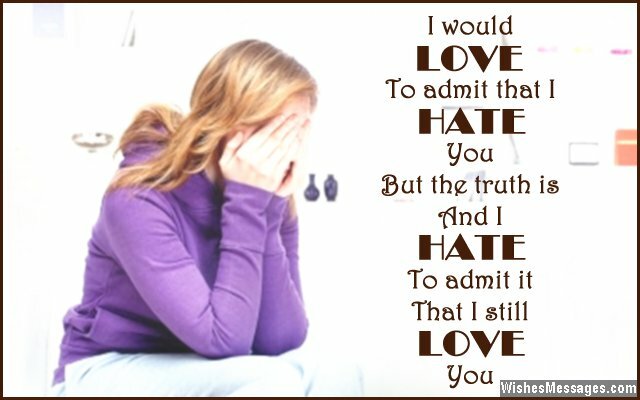 31) I would LOVE to admit that I HATE you but the truth is and I HATE to admit it, that I still LOVE you. Happy birthday. 32) Your birthday calls for celebrating our mature relationship as an ex-boyfriend and ex-girlfriend. I am proud to say that we are an example of how a couple can remain friends even after breaking up. Happy birthday. 33) We may pretend to hate each other today, but I hope my love drives all the animosity away. Although we are not boyfriend and girlfriend anymore, I still love you just like I did before. Happy birthday. 34) I have wished you on your birthday since many years and our breakup is not going to change that. Happy birthday. 35) Had I known from the beginning that you make such a good friend, I would never have fallen in love with you. Happy birthday. 36) When I started going out with you, I knew you were special. But I did not know that you were so special that we would keep in touch even after breaking up. 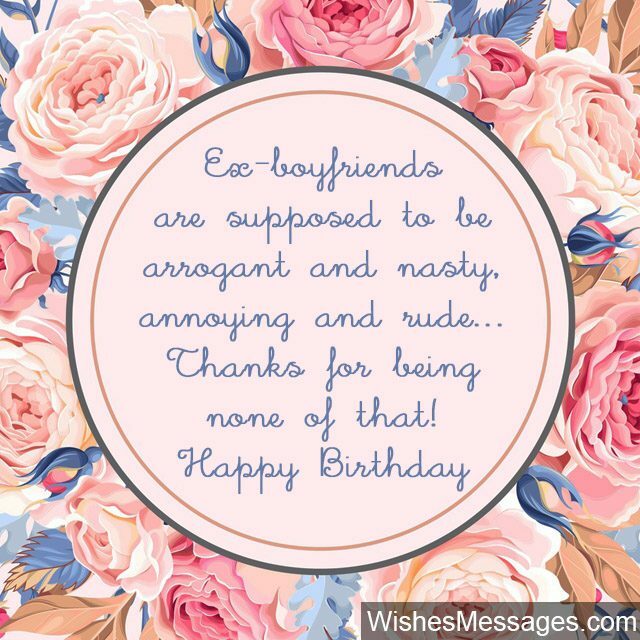 Happy birthday to a special ex. 37) I am not stressing about the memories of the past, but I am glad that we broke up. I am not stressing about the worries of the future, but I think we will make good friends. Happy birthday. 38) Let me make a wish for you on your birthday today. I wish and I hope that one day once again, we cross ways. Happy birthday. 39) We may not be holding hands on your birthday, but I hope it doesn’t stay this way. Happy birthday. 40) Your birthday calls for celebration because we are still talking to each other, and not flinging dirty gossip and hate at one another. Happy birthday.